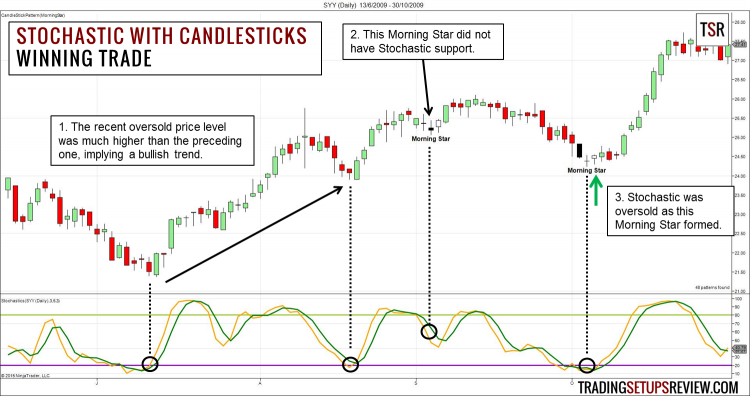 New traders make the mistake of treating candlestick patterns as simple trading signals. They do not realize that most candlestick patterns are defined using the last two to three price bars and ignore the price action context. Hence, it is crucial to combine candlestick patterns with other methods of analysis. 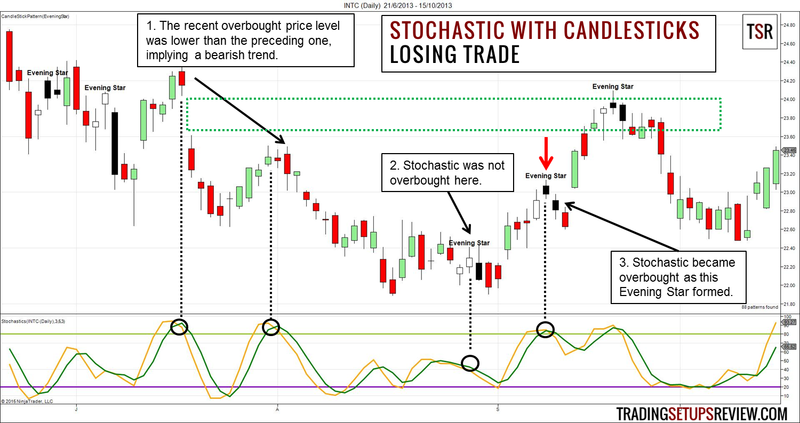 In this swing trading strategy, we will use the Stochastic Oscillator to find high-quality candlestick patterns. 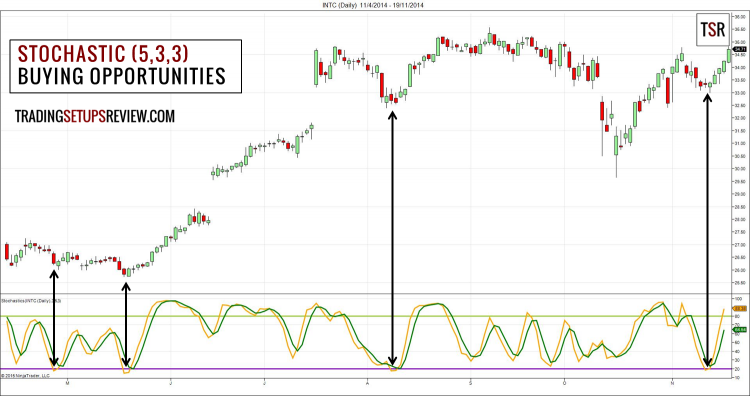 The Stochastic (5,3,3) setting is sensitive, and hence suitable for finding short-term retracement trades. Gaps are characteristic of daily charts that swing traders use. While gaps pose a risk for swing traders, they reveal precious market clues. 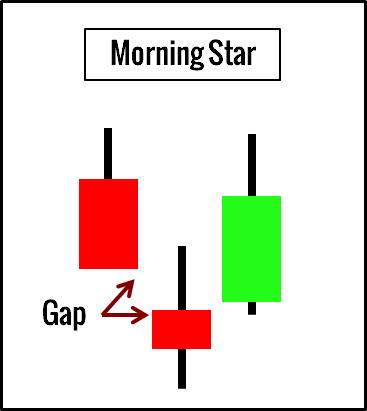 The Morning/Evening Star candlestick patterns take advantage of these “clues”. Thus, we will focus on these patterns in this review. Of course, you can also use the Stochastic Oscillator to confirm other candlestick signals. Buy once a Morning Star candlestick pattern is completed. Buy once a Evening Star candlestick pattern is completed. For simplicity, you can use price action and the Stochastic Oscillator to judge the market trend. Refer to the examples below. This is the daily chart of SYSCO Corporation (SYY on NYSE). The bottom panel shows the Stochastic Oscillator. Look at the last two points when the Stochastic was oversold. Compare the price levels. If the more recent oversold point is at a higher price, we are bullish. With a bullish view, we looked for Morning Stars. This Morning Star did not occur with an oversold Stochastic reading. Thus, it did not fit our trading rules. The second Morning Star had the support of the Stochastic Oscillator and fitted the bill. We went long as the Morning Star completed. In this example, we managed to skip the losing pattern and take the profitable one with the help of the Stochastic Oscillator. The chart above shows the daily price bars of Intel Corporation (INTC on NYSE). Look at the last two points when the Stochastic was overbought. Compare the price levels. If the more recent overbought point occurs at a lower price level, we are bearish bias. We ignored this Evening Star pattern as the Stochastic Oscillator was not overbought. This second Evening Star pattern formed as the Stochastic Oscillator became overbought. Thus, it was a valid bearish setup. However, this setup failed quickly as the market gapped up. While we managed to filter out the first Evening Star with the Stochastic Oscillator, we could not avoid the second one. This short setup, despite its failure, was reasonable. One minor factor that might have deterred us from going short was the price gap highlighted by the green box in the chart above. The market has a tendency to rest obvious gaps like this one. Hence, if we held this expectation, we would not have taken the short setup. Combining candlestick patterns with technical indicators is a sound approach. Here, we combined an oscillator and a three-bar pattern to find pullback trades. This trading strategy is not perfect and is certainly not profitable if traded mechanically. However, it offers a solid starting point for both system and discretionary swing traders. Both the Stochastic Oscillator and candlestick patterns are well-defined. Hence, they are easy to code into market scanning software. For swing traders finding opportunities among hundreds of stocks, this is a huge advantage. Confused by complicated patterns? 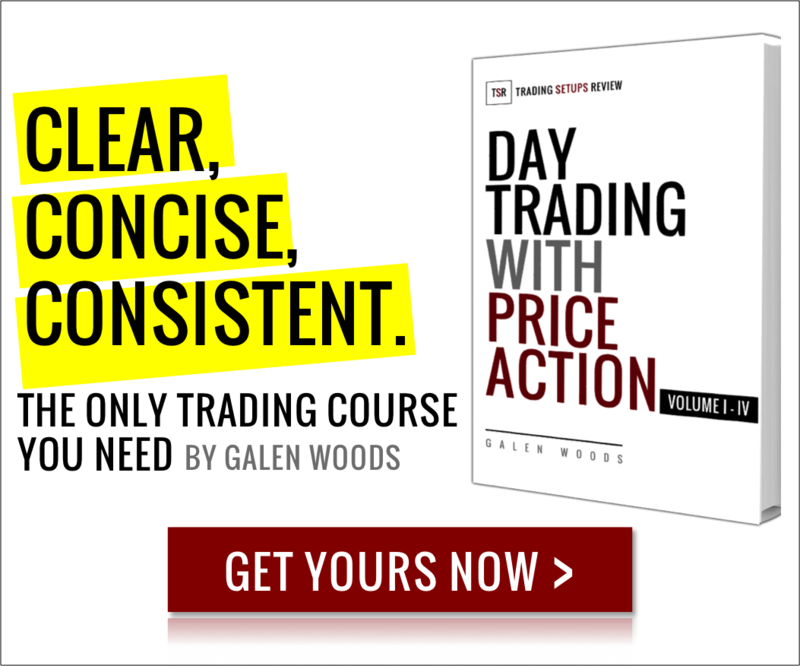 Pick up a simple and effective price pattern to improve your trades. As far as free internet information goes for trading and trade set-ups….THIS IS AMAZING!!! I appreciate the insight that they have and detailed information backed by data/resource. Pretty cool guys thanks for your time…. now, more effort for us soon to be trader! Thanks for the comment! Great to hear that you find the website useful. We’ll definitely keep adding new helpful stuff. If you have any suggestions, please let us know! stochastic 5,3,3 crossover below 20 directly in line with bullish engulfing candle ? Glad you like it! From this list, it seems like Stockfetcher has a candlestick indicator and a stochastic indicator. You can definitely combine them to produce what you are looking for.